I am not once again going to point out the depth of the hypocrisy of the Ghanaian Christian or the preposterous bias of the Ghanaian social media moralist but certainly, I would discuss the hovering disgrace surrounding Yvonne Nelson’s recent pregnancy to the delight of the few reasonable men—after all, the moral and religious “crusaders” now say I am strident. It’s ridiculous, in fact, completely unacceptable in any honest discourse for anyone who faithfully ascribes to any of the Abrahamic religions to argue that, a woman who is said to have fornicated and now have a baby with someone’s husband—what’s called adultery and punishable by stoning under Sharia or everlasting celestial torture in a lake of fire, has not done anything wrong. Things are adding up pretty fast. And of course, they are casting dark smithereens of cloaks on Yvonne Nelson who has probably at this stage realised she should not have granted the WOW Magazine interview, in which she spoke about her baby’s father whose alleged wife has come out to shred both of them into pieces. In July 2017, GhanaCelebrities.Com broke the news that Yvonne Nelson was pregnant and she was hiding it. 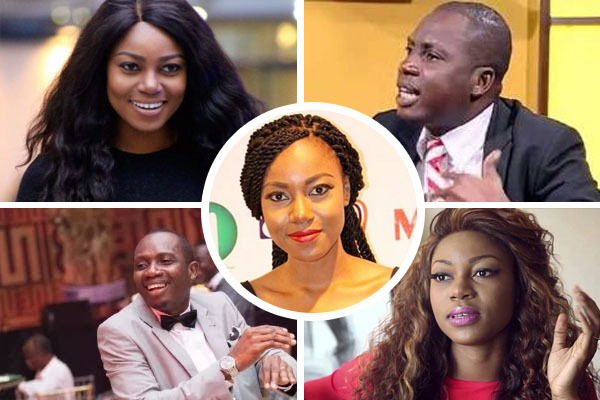 The actress together with her bunch of friends, best described as pitiful stooges went to all levels to deny that Yvonne Nelson was indeed pregnant. Then it emerged a few weeks ago that, the same Yvonne Nelson who was said not to be pregnant had given birth. Even that, her lackey, Abdul Salaam Mumini granted an interview to JOYNEWS, throwing the usual dust that Yvonne Nelson had not given birth as being claimed. Despite the arduous struggles to hide Yvonne Nelson’s pregnancy and childbirth by herself and friends, she posted a WOW Magazine cover and an exclusive interview on Saturday, her birthday—with her baby bump, officially announcing that she has indeed given birth. But even before that and right after it was reported that she had given birth, GhanaCelebrities.Com hinted that Yvonne Nelson’s baby father was married, someone’s legal husband. The Yvonne Nelson premature interview to WOW Magazine ended up being a straight door into her covered an*s. She stated that she wants to get married in life but the man who she had given birth for, already with kids had not expressed any interest in marrying her—but since age was catching up on her, they both found it prudent to have a child out of wedlock. She added that the man is a British—sort of confirming earlier reports that she had given birth to a mixed race. With tiny details of the baby father out there, the social media hunt for the mysterious man was on. Quickly, he was fetched out as Jamie, a UK based photographer—and GhanaCelebrities.Com managed to fully identify him as Jamie Roberts, who got married to a Nigerian social media slay queen, Keela Harrison ‘Roberts’ in 2015 in the United Kingdom. This is where it gets interesting: chats between the wife of Jamie, now known as Keela Harrison Roberts and a friend were published online—and in these chats, she discussed how shortly after Yvonne Nelson became friends with her to buy slimming pills, jumped on her man. She added that the reason why Jamie could not marry Yvonne Nelson is that she is legally married to him—and doing so would be a crime in the UK, bigamy. To establish the veracity of Keela’s claim, GhanaCelebrities.Com went into digging mode and found a screenshot of a video from Jamie and Keela’s wedding which took place on 5th December 2015 in London—sort of confirming that, indeed Keela is Jamie’s wife as claimed. Also, several Instagram photos found on Jamie’s page show a connection to Keela, known as “Theglamannequin” on Instagram. Keela has commented on numerous photos posted by Jamie and the comments clearly confirm their relationship. Considering the botched clandestineness that was built around the Yvonne Nelson’s pregnancy and childbirth and the available Keela evidence, it’s reasonable to conclude that, indeed Yvonne Nelson didn’t want us knowing a lot like we know today about her baby father. Obviously, Yvonne Nelson wanted to control the conversation, and this is because developments show or paint her as a home wrecker, an adulterous woman, a fornicator and a husband snatcher. “This is deeply disappointing, I thought Yvonne Nelson was different and I believe she could have done better with a decent man just for herself,” a friend said. Maybe Yvonne deserves better—whatever it’s, I cannot still understand why our Celebrities cannot find genuine and scandal-less men to settle down with it. More also, the thought of Yvonne Nelson the adulterous woman going to spend an eternity in hell alongside Adolf Hitler and others is deeply perturbing. The adage “all that glitters is not gold” remains relevant, especially when it comes to those we call Celebrities.